When it comes to fermented foods the key word for the Nepali community in West Bengal’s Darjeeling hills is moderation. Fermenting, according to the community members, makes food palatable, digestible and possible to store for the lean months. But if you indulge yourself, do it at your own risk. The pleasant summer of this region produces plentiful greens. In fact, too plentiful to be consumed fresh. Rai shaaki, or mustard greens, are especially found in abundance since they are popular and all farms have a substantial patch of mustard (Brassica juncea). Farmers allow the surplus leaves to wilt for a day or two and then pound them with a little water, squeeze them and finally pack them away in tight-lidded jars for a few days to ferment. When it is suitably fermented the leaves are taken out and dried in the sun. Protected from moisture, gundruk can be used for months, forming a valuable source of nutrition during monsoon and winter when hardly any vegetable is available. But gundruk is more than just a nutrition supplement. In the dark and foggy monsoon, when both digestion and mood are sluggish, hot and peppy gundruk jhol is a much-needed mood lifter. Subhash Lepcha, a farmer in Chota Mangwa village in Darjeeling, says appetite dies after sunless days of continuous rain and fog. At this time, he says, a bowl of hot gundruk jhol with one’s meal really cheers one up. “Once you gulp down a hot mouthful and it is burning down your chest, you can’t but let out a loud ‘Aaah!’,” he enthuses. Its distinctive sour-hot taste tickles the taste-buds, aids in digestion and stimulates bowel movement (hence moderation). It should not, however, be taken at night, say the community members. At a time when traditional eating habits are dying, gundruk holds its own because of its unique taste. “It is much in demand in neighbouring cities like Kalimpong and Darjeeling,” says Lepcha, “Farmers grow it as much for sale as for domestic consumption.” And as long as rains and fog are plentiful, one can expect gundruk to be around. Method: Wash the gundruk strands and soak them in water for an hour. Squeeze out the excess water and chop fine. Chop the tomato and onion finely. Slice the ginger and garlic as thinly as possible. In a pan, heat the oil and add mustard seeds and red chillies. When the chillies are well fried, add the chopped onion, ginger and garlic and stir well. Add salt and turmeric, and cook a little. Add tomato and cook for a few minutes. Add the gundruk, mix well and cook till gundruk is soft. Add water and bring to boil. Let it simmer for a few minutes. It is done when gundruk strands are soft but still chewy. 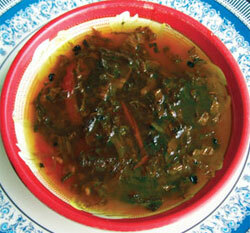 Serve hot as accompaniment to regular meal.